Ben Wolfe is a commanding presence beside the gravitational weight of his bass violin. 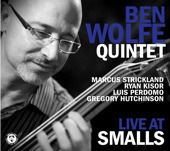 On Live at Smalls, Wolfe brings something of the fabled Charles Mingus' authority and leadership to his own quintet. It had to be so; Wolfe undertakes to have four towering individualists interpret the charts performed on this date at the club that is now becoming all the rage of Greenwich Village, NYC. Pianist Luis Perdomo, somewhat better-known for his tumbao, is heard here negotiating the knife edge of Wolfe's music, that slices slivers off everything that the rhythmic complexity of bebop inspired. Tenor saxophonist Marcus Strickland and trumpeter Ryan Kisor often get into each other like the men with horns that they are. And drummer Gregory Hutchinson provides a perfect foil for Wolfe, shaping the internal beat while the bassist charges on, effecting subtle and not-so-subtle changes to the rhythm, sometimes even abruptly changing course, as he does on "For the Great Sonny Clark." On "Contraption" things get even more adventurous. Wolfe and the quintet create a performance of such majestic elasticity that its twists and turns dazzle like mighty paradigms spun off the harmonic intrusions that dapple the melody. Wolfe and the quintet move things into a higher energetic gear on "Unjust," and there is some truly fine ensemble playing on this track, with fiery brass work from Kisor and playing of immense gravitas by Strickland. And just when it seemed that the quintet was simply racing along, Wolfe calls for the tender ballad, "I'll Know You More," where Strickland uses his probative tenor to cut through the shroud of emotions that swathes the piece. "Double Czech" takes place where atonality and the absolutely masterful tonality of Wolfe's bass collide. Although the recording here becomes almost sotto voce, the menace in the bass solo, as it devours the melody, is palpable. 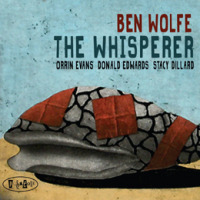 Ben Wolfe appears to split this performance into that which the quintet will perform with great attention to detail of the nooks and crannies of the composition, improvising as only versatile masters of each instruments can. And then there is the solo work the bassist springs upon his audience with vivid color and majestic command of his instrument. He is able to extract the darkest possible emotions from the instrument, as well as provide a lithe touch to his playing, sometimes adding a wry sense of humor. His broad opening to "Coleman's Cab," and the short but incisive "The Trade," are dazzling examples of this kind of playing. This, all told, an emerging drama to the music from the performances at Small's. It is all due to the outstanding stewarding that Ben Wolfe does with his quintet, sometimes egging them on verbally as Mingus used to do. And the effects are all too marvelous, as well.